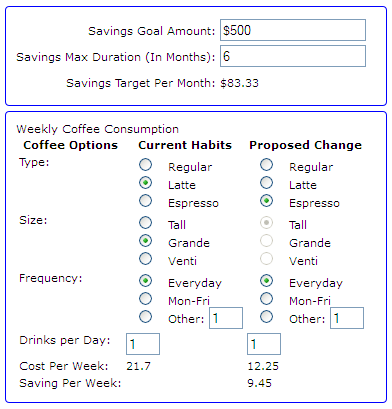 In our index.html page, let’s add a second section tag to represent our second panel / view: the consumption-scenarios-view.The view will let us enter current habits and see how modifying these habits can yield savings counting towards our saving goal. For now let’s just assign currentConsumption and proposedConsumption to a ko.observable(null) for now – we’ll change that later (once we create the needed sub-view model). 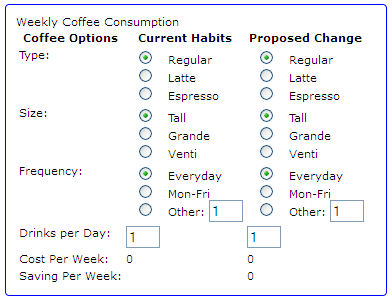 We need a way to model our coffee consumption. 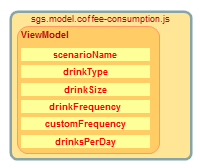 So we’ll create a new module file named sgs.model.coffee-consumption.js under scripts/viewmodel. You can also step through the code in the debugger if you really want to check out what happens. 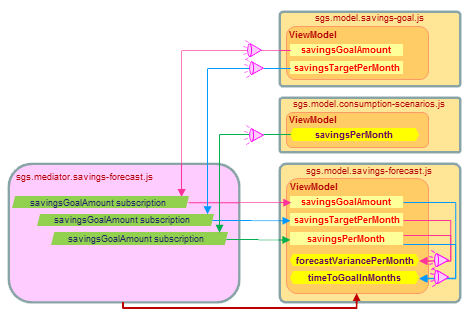 Later on we’ll come back to this view model and complete the stub implementation of the costPerWeek dependentObservable function to calculate the actual cost of the consumption model (based on pricing). Let’s tackle the view mediator and connect the parts! 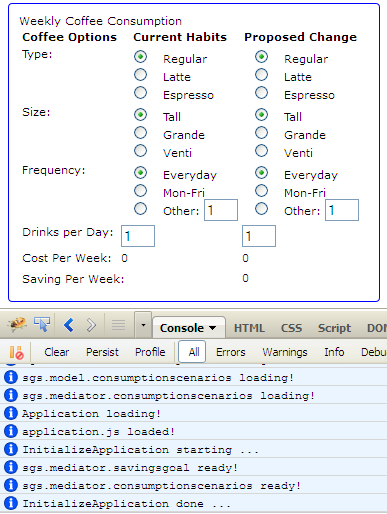 In the ViewMediator folder under the scripts folder, create a file named: sgs.mediator.consumption-scenarios.js. the page, the consumption scenario view, and its view model. 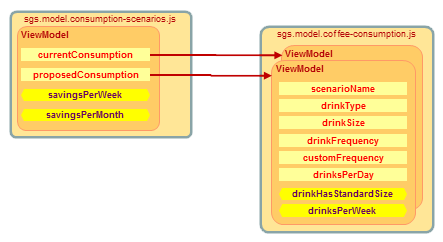 So let’s implement the first responsibility to instantiate a view model for the consumption scenario view (using the initializeViewModel function we just created in the consumption scenario view model module). Caution: the name of the attribute is “enable” (not “enabled” – I have been bit by that many times)! Now we can call the setViewModel function from inside createViewMediator to save off our freshly-created view model. You will then see the radio buttons get set to their default value. And clicking on the Espresso radio button should cause the Size radio buttons to become disabled. Now we’ll create an examplePricing function which will return a hash of key-value pairs where the key will be a composite of the coffee type and size, and the value an amount. 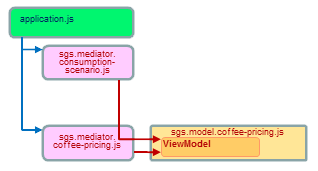 In the Viewmediator folder under the scripts folder, create a file named: sgs.mediator.coffee-pricing.js. This is the module where we’ll place our data-binding logic as well as any code related to mediating access between the page, a future pricing editing view, and its view model. Note: this mediator will not need to setup any data-bindings with the view, since we are not planning on displaying the pricing. However, the consumption scenario mediator will collaborate with it in order to access its pricing view model. 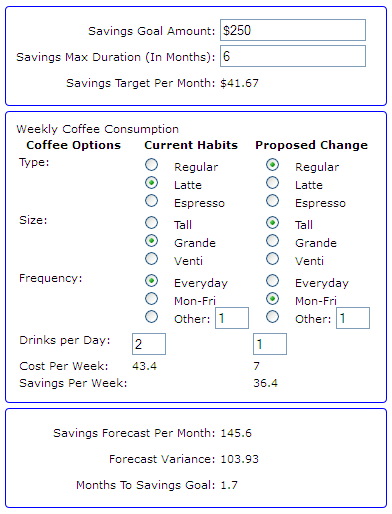 (using the initializeViewModel function we just created in the coffee pricing view model module). The view will help us compare projected savings against our goal. 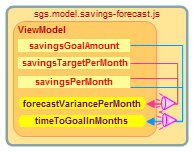 In the ViewModels folder under the scripts folder, create a file named: sgs.model.savings-forecast.js. Let’s create our initializeViewModel function to initialize the view model. Design Note: in this series of tutorial I have promoted the idea of decoupling all views, models, and mediators (as possible) as it makes the application more modular and it is easier to test all parts independently. 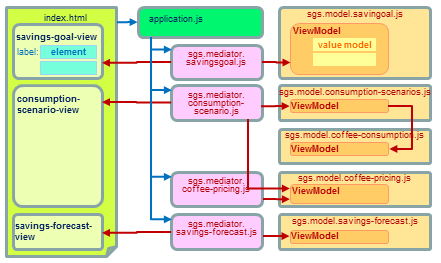 So for this view model, instead of requesting the value models from other mediators namely savingsGoalAmount, savingsTargetPerMonth and savingsPerMonth, we will create dedicated value models which will later synchronize with using subscriptions in our mediators – since it is ok for the mediators to collaborate. In the Viewmediator folder under the scripts folder, create a file named: sgs.mediator.savings-forecast.js. 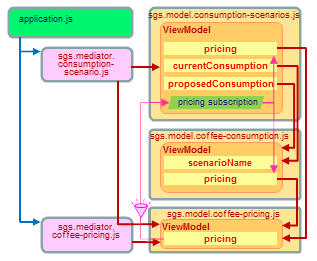 This is the module where we’ll place our data-binding logic as well as any code related to mediating access between the page, the consumption scenario view, and its view model. Now let’s declare the data-bindings we need. Playing with the simulation should now update the savings-forecast view. Now you can refresh your page and should be able to see the new savings forecast view update as you experiment! 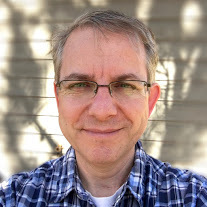 If we step back and look at the modularization of our application so far, we’ll notice that although our models and view mediators are modular, the actual index.html web page has become larger and is not modular at all. Wouldn’t it be nice if we could extract each of our views into external modules? Well, this is exactly what part 4 will cover!